The Harrier is powered by a 2L 4-cylinder diesel engine. 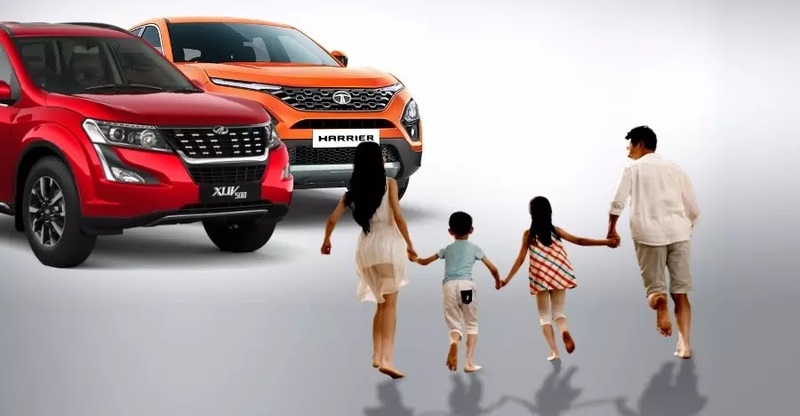 Tata Harrier fuel tank capacity is 50L with a decent fuel economy of 17kmpl. The transmission is a 6-speed one with only manual transmission available. The machine provides a laudable max power of 103kW at 3750prm and a max torque of 350Nm at 1750-2500rpm. This car is available in both petrol and diesel variants, with a 2.2 L mHawk 4-cyclinder 2.2 Turbocharged and a mHawk155 Diesel engine(eVGT) in the petrol and diesel models respectively. It gives a slightly lower fuel economy with 13-16km/L but compensates with a larger fuel tank of 70L. The transmission has both automatic and manual options available with a max power of 140hp at 4500rpm and max torque of 320Nm at 2000-3000rpm. The dimensions of the car are 4598x1894x1706 (length x width x height in mm). It has a wheelbase of 2741mm and a ground clearance of 205mm which is perfect for large speed-breakers on city roads or other tumultuous off-road experiences. It also has ample boot space of 425L which increases to as much as 810L with its rear seats folded. With disc brakes in the front and drum ones in the rear and independent and semi-independent suspensions in the front and back respectively, handling this heavyweight becomes a piece of cake! The dimensions of the XUV500 are 4585x1890x1785(L x W x H in mm), which makes it slightly taller in height than the harrier. It has independent suspensions on both ends unlike the harrier with Anti-Roll Bar. The brakes types are also different here, with the rear end also having disk brakes. The XUV500 has similar ground clearance at 200mm but stands at a disadvantage with a much lower boot space of 93L. The Harrier perfectly sports the combination of orange (or any other variation), silver and black from the dual-toned front to the perfect incorporation of the silver chin guard and also the uniquely designed honeycomb-like grille. The high shoulder line, sleek spoiler and 3D LED taillamps are eye-catchers. The HID projector headlamps and the five spoked alloy wheels give an overall streamlined look to the car. The XUV500 is the physical manifestation of ideas like style and agility. The projector headlamps up front with the LED DRLs provide the space for the new grille to shine through whilst maintaining its majestic presence. The new diamond cut alloy wheels, the innovative black accents beside the grille and the styling on the vertical door handles seem to go in perfect unison.